The Drexel swimming team showed its ability to compete on a national stage at AT&T Winter Nationals. Four Drexel swimmers traveled to Austin, Texas, for the AT&T Winter National Championships from Nov. 29 to Dec. 1 to compete against some of the nation’s best swimmers. Winter Nationals is one of the fastest short-distance meets in the world, making qualifying for it that much more impressive. Athletes from many different levels, including collegiate, club and Olympic, come together to make one of the most exciting meets of the year. For the quartet of Dragons who qualified — senior Lauren Faykes, junior Gregory Oprendek, sophomore Andrew Reimon and freshman Kyle Lukens — competing at the meet offered valuable experience lining up against world-class talent that they will undoubtedly be able to use throughout the rest of their swimming careers. Head swimming coach Shawn Markey understands the importance of such an experience and was happy to see his athletes take advantage of the opportunity. Not only did the Dragons enjoy the meet and experience a big stage, they also swam exceptionally well, with each one of them earning a season-best time. Faykes kicked off the competition on a high note for Drexel in the 200 individual medley on day 1, swimming a personal best and breaking a long-standing school record. She finished the race in 2:05.69 to best Cathy Meehan’s time of 2:06.64, set in 1990. Markey was thrilled with Faykes’ performance in the race, commenting that her time “is a very big accomplishment for her and our swim program. This was by far the most impressive and exciting takeaway from the meet.” The record in the 200 IM marked her fourth individual Drexel record and seventh overall including her three relay records, establishing her as Drexel swimming’s top record holder. Faykes kept her momentum going Nov. 30 with a solid time of 57.19 in the 100 butterfly time trial. On the men’s side, Lukens raced to 51st place in the 100 butterfly in 50.35. He later followed up his first performance with another 51st-place finish in the 100 backstroke, clocking in at 51.02. Reimon competed in the 100 breaststroke, finishing in 56.97 for 40th place. Gregory Oprendek finished in 57.15 in the same event, which was good for 44th place. On the third and final day of the competition, Faykes, Reimon and Oprendek once again posted impressive performances. In the 200 butterfly, Faykes finished in 39th place, touching the wall at 2:01.76. 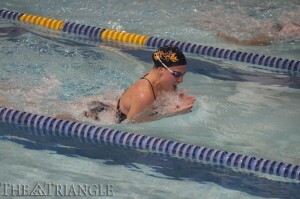 She also posted a time of 56.71 in a 100 butterfly time trial, which beat her own record of 56.88. Reimon and Oprendek capped off the day for the Dragons in the 200 breaststroke. Reimon stopped the clock at 2:03.52 for 33rd place, and Oprendek finished in 2:04.63 for 43rd place. While the Winter Nationals were a successful experience for the Dragons, they now look ahead to further training and to their next meet Jan. 12 against the University of Delaware and Northeastern University at the John A. Daskalakis Athletic Center. Markey looks forward to the next few weeks, as it is a crucial training period with no interruption from competition. Drexel and Delaware have an especially rich history that goes back many years and will surely fuel the athletes’ competitive spirits and make for an exciting and entertaining meet.